At the group stages of Copa America 2015, against Brazil, it seemed as if Carlos Sanchez was everywhere. Sporting a floppy afro as if it were a halo, the defensive midfielder scrapped, scraped, and turned the screws on a talented Brazilian side. It was a game that Colombia won and once again reaffirmed why ‘La Roca’, as he is called in Colombia, is what the nation needs if they are to take their technical game to more physical levels at World Cup 2018 in Russia. Both James Rodriguez and Juan Cuadrado allow themselves more attacking opportunities at the behest of an energised Sanchez, and if their ‘roca’ can boulder through the defences of their opponents then Colombia will once again be favoured to advance to the knockout rounds. 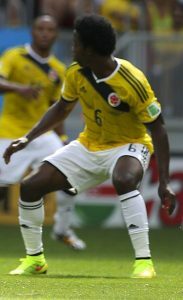 A native of Choco, a proud Afro-colombian region of the country, Sanchez was born in the department’s capital of Quibdo. His understated role in the team endears him to Colombians as does his wide beaming smile on and off the pitch. He completed his apprenticeship in Uruguay for Riverplate Montevideo, after which he has been a journeyman, surveying the many options in Europe that have wanted to take the young Colombian on. At French club Valenciennes he ground out 148 games, leaving the club in 2013 after finally securing a contract in Spain. Debuting against Panama in 2007, he has made 79 appearances for his country but is yet to score. Colombian football fans will be hoping that Sanchez can make light work of Poland, Senegal and Japan’s attacks before moving on to Messi, Neymar and possibly Mueller this summer in Russia.